To commemorate Week of Alex II, I've got a really cool tool for you on this week's Toolbox Tuesday! 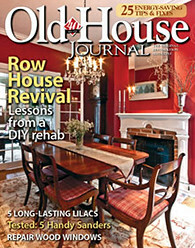 Last week I covered my simple and standard method for shaving down drywall using a rasp. Tools like those are basic necessities and don't add much complexity to the project but serve their purpose. Similarly, I've always used the simple method for cutting drywall. Well, this weekend my world was turned upside down. Are you ready for this? Check out the Glodblatt Blade Runner drywall cutting tool. This thing looks more like a TV remote than a drywall tool, and it completely has me won over. I saw this for the first time on This Old House's "What Is It" segment a while ago, and then I randomly ran across it a little while ago on Amazon. I remembered being pretty interested in how it worked the first time I saw it, so I decided to order one for myself and give it a shot...you know, for the blog. Boy am I glad I did. When I received the tool in it's package, I was pretty surprised by its heft. It was much heavier than I expected and far more solidly built. I don't know why, but when I typically think of drywall tools I picture flimsy plastic or thin metal. This two part tool is quite solid and feels like it will withstand the typical harsh treatment that most of my tools are subject to. When I removed the cutter from the package, I pulled the two pieces apart to have a look. 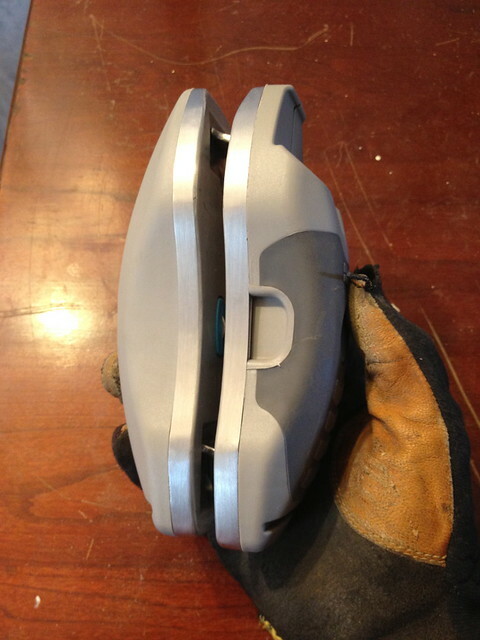 It has an ergonomic design that allows you to easily grip it, and the two halves are secured by heavy duty magnets. I sat the two parts down to take a look at them and realized they are probably one of my most futuristic looking tools. Is it weird that I identified it that way? If you notice, the top half has two spring loaded metal support stands that protect the cutting blades and also keep the two pieces somewhat separate from each other when not in use. More on that in a bit. When you pull the tool apart and flip the pieces over, you can see the key to this tool's functionality. 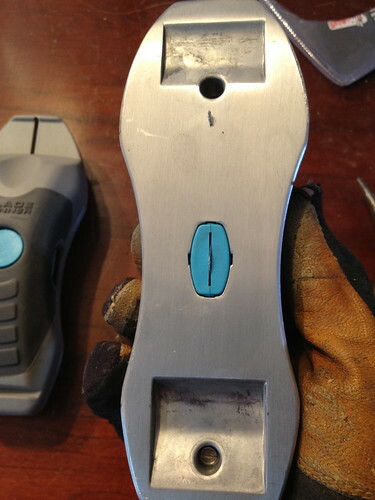 There is a small blue plastic piece with a replaceable blade right in the center of each component of the tool. 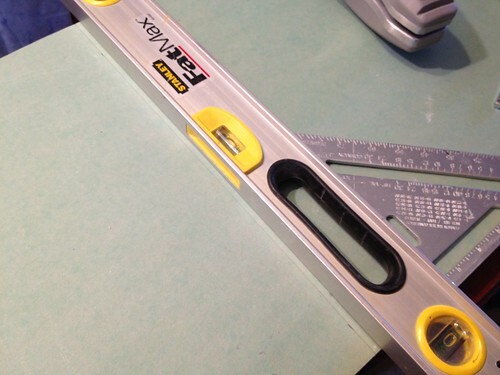 This blade is ultimately responsible for scoring the paper on either side of the drywall. Before I get into the way this tool works, I have to give you one major word of warning. BE CAREFUL WITH YOUR FINGERS!!!! The magnets are very strong, and when the tool is in two pieces, it very badly wants to become one piece again. If your fingers, hand, toes, nose, or anything else happens to be in the way, you'll end up with a pretty big pinched whatever. And if you're really unlucky, you'll end up with a pinch on the edges of the tool while your hand or finger could be between the two sharp blades in the middle...so be careful. I very much not even joking here. Ok, enough with the warning, time to see what this tool can do. The actual process of the cut doesn't start much different from what you're used to. First step, mark your cut. The main difference here, your cut doesn't have to be a straight line. It happened to be straight in my case, but you can make pretty wavy lines and it will still give you good and accurate cuts. 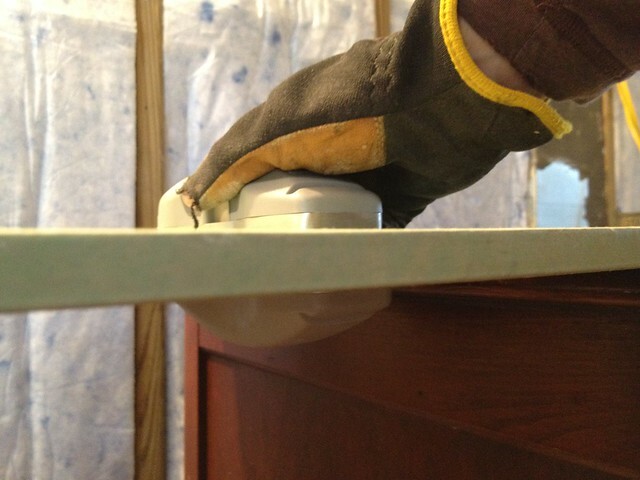 Next, begin pushing the tool into the side of the drywall with half above and half below the piece you're working on. As you push the tool onto the drywall those little spring loaded supports I mentioned earlier fold in on themselves and allow both sides of the tool to sit flat. But the thing that really makes this tool unique are the heavy duty magnets. As the supports collapse and the tool begins to separate, the magnets keep the top and bottom aligned right through the drywall. Since each side of the tool has its own small blades, the top half cuts the paper on the top, and the bottom half cuts the same spot on the bottom. As I said, this is the true key to the usefulness of this tool, it makes both cuts at once while the magnets keep the blades lined up to cut the same spots. 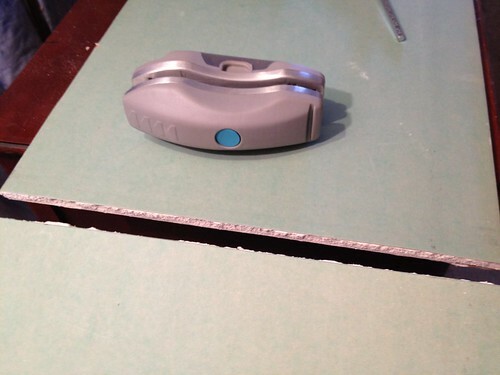 This allows the drywall to break more cleanly along the cut, since it's no longer supported on either side by paper. Once you get to the end of the material the spring loaded supports pop back out to ensure the tool stays the correct distance from either half, and then the tool becomes one piece again as you move completely off of the material. As you can see in the photo, the cut is clean, precise, and needs almost no cleanup. When I cut the drywall my normal way I often end up with some extra material that I need to shave away, or a bunch of ripped paper if the pieces I'm cutting are particularly large. I think that scenario is pretty much a thing of the past with this tool. I've already told you that I absolutely love this tool, and I really can't wait to use it when I need to cut long and slightly irregular shaped drywall pieces. 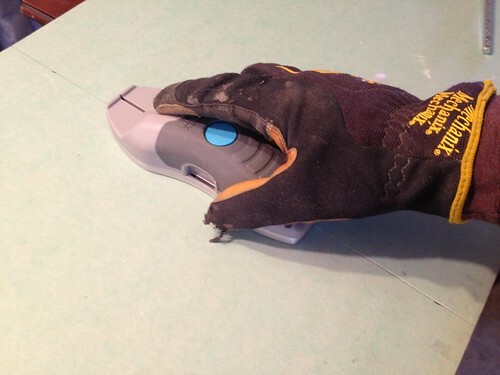 I think it will also really come in handy when I need to make cuts out of the corner of or middle of pieces of drywall. Above all else, I think it will take a lot of the guesswork and cumbersome effort out of the equation in allowing me to more easily make one pass for my cuts. All that being said, I have one primary complaint with the tool. 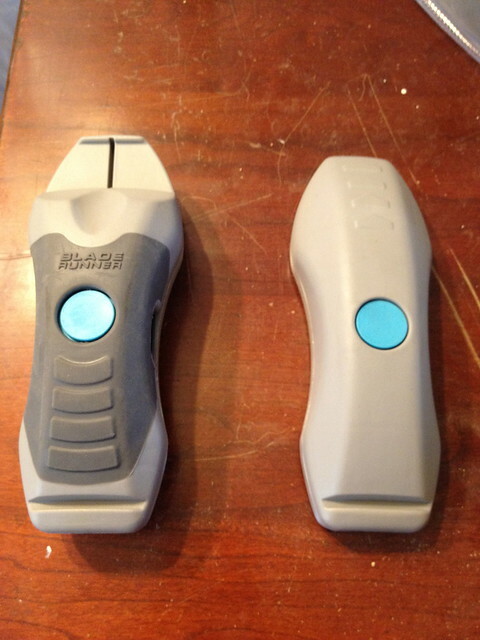 As I mentioned, the tool has an ergonomic design so that you can easily hold it. The problem with this is the rear of the tool is not as wide as the front of the tool. This is only about 1/8" off, but this means that I can't rest the side of the tool on a straight edge to make the cut. Had they made the tool with a consistent line on the side I think it would be even more useful. So if anyone from Goldblatt reads this, please make it consistent from the front to back on the sides! 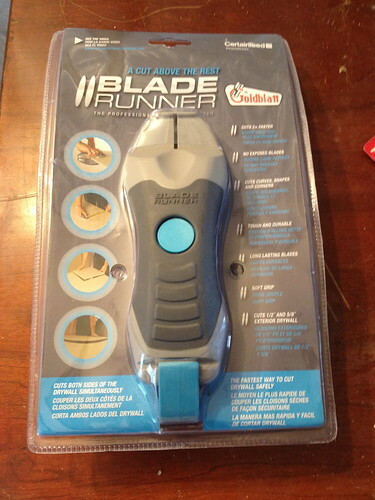 In addition to the tool I also purchased a package of the knife replacements. I figure there's a pretty good chance for the blades to get dinged up, so I might as well have a few extras on hand just in case. What do you think? Does it seem like a tool that's worth the money, or are you going to stick with your utility knife (or circular saw, gah)? I know I felt like I didn't really need it at first, but the more I thought about it, the more I felt like it was a good purchase. This is REALLY cool! 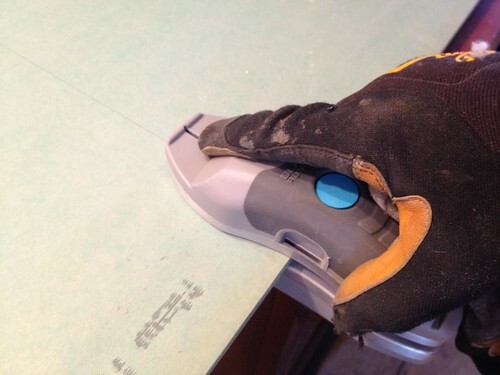 We have a whole heck of drywalling in our future, and this could come in really handy. 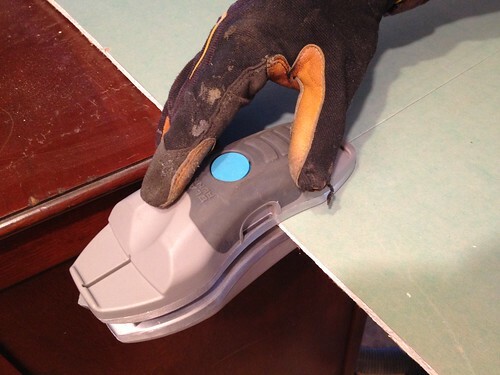 I think it's a great tool, and it certainly will do the job well, and maybe a bit quicker, but unless you do a lot of drywall, I don't see the point in investing in a tool like this. In my house, I've done quite a bit of drywall, but once I'm done, I might never need it again. I think the major advantage with this tool is that it would let you easily do gentle curves and circles with beautiful results. Looks sweet, and ya, the straight edge design would be an asset, and do doubt when I get my hads on one i can probablt gerry rig something to do jst that. what you pay for it? 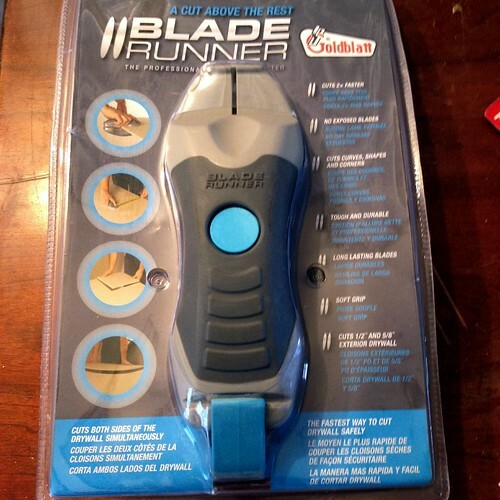 We Required Blade Runner - The professional's plasterboard cutter.